When the specs for Google's Nexus 4 came out, most critics were more than thrilled. A very fast processor, lots of RAM, a big display with very high resolution, and an 8MP camera made it the media darling of the smartphone world. It climbed the ranks of the best smartphones available, but couldn't quite reach to the top due to one reason—no 4G LTE. 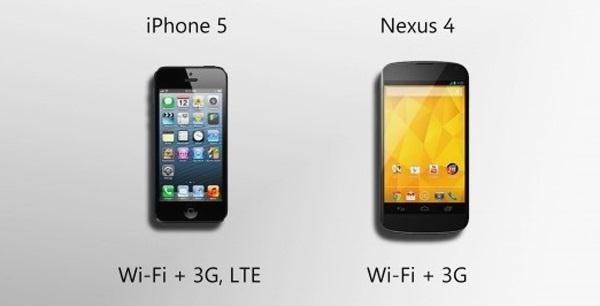 Samsung's Galaxy S III and Apple's iPhone 5 both come with 4G LTE, so why couldn't the LG Nexus 4? While there are many reasons, Google was stated as saying, "Tactically, we want to make sure the devices are available for every network on the planet." Since 4G LTE is different for each network carrier, Google would have to build a custom phone for each of them. This would increase the price of the phone, causing it to lose some popularity. When the phone finally came out, it was taken apart by many popular websites, as is the norm with new any new device. iFixit found that the phone does actually come with a 4G LTE chip, but couldn't function because of the missing 4G LTE radio. Well, thanks to XDA Developers forum member a1jatt, 4G LTE can now be activated on the Nexus 4. While this is very simple, it won't work for everyone. The LTE will only work if you're on a wireless carrier that uses spectrum on Band 4 including Telus and Rogers & Bell in Canada. AT&T in the U.S. is not on Band 4, so U.S. users will have no luck with this. But try it out yourself to see if it works, it could work for other carriers. Note: Enabling the 4G LTE may decrease signal performance and drain battery. Note: In order to revert back to the 3G connection, choose "WCDMA" (or GSM) after dialing *#*#4636#*#*. it should be noted that this does not work on T Mobile devices after receiving jelly bean 4.2 update. This dosent work it says invalid MMi could it be that I'm using the 4.3 update? in the UK, can you use a EE 4G sim with a rooted unlocked Nexus 4 running android 4.3? will this work with straight talk 4g? This is a complete waste of article. 1st off you need to be rooted, you need to set the APN, you need to to be running either radio .27 or .33 or a hybrid including 1 of the 2, and you need to edit the build prop or you going to have to do ##info## after every reboot. This article should be removed to help avoid confusion. I want to buy Nexus 4, its comes with kitkat 4.4.3 .
does this trick or software of change network wcdma to lte works in it?